Open – 9:30 AM to 4:00 PM. I was warned that the park gate is locked PROMPTLY at 4 PM, so make sure you are out of the gate. Dog friendly? No dogs allowed on the property Sorry my four legged friends. Stroller friendly? Very stroller friendly, about half the trail is paved, the other half is extremely well maintained. Benches? TONS of benches, including swinging ones! Tons of great spots to take a seat and hang out. 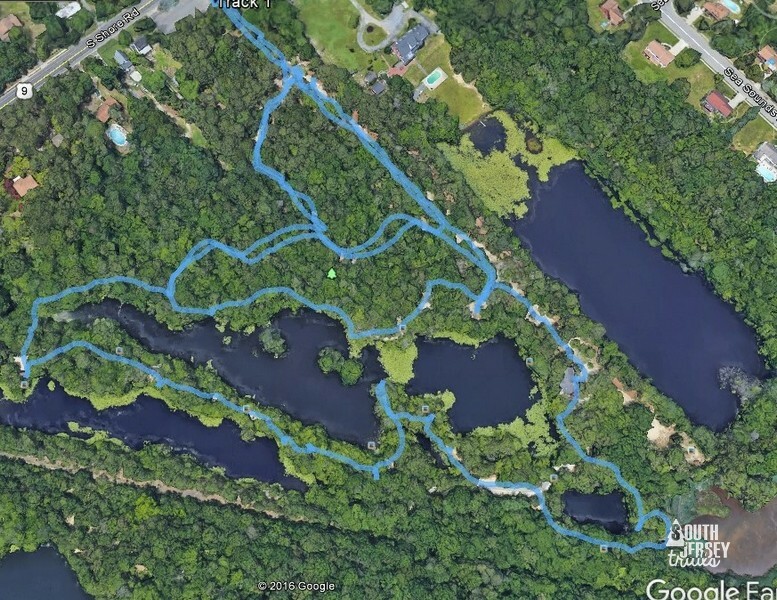 Hiking track laid out over Google Earth image. 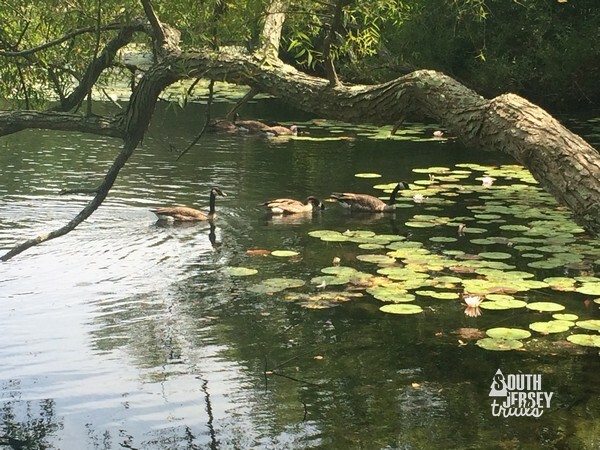 Description – The last week of August, I took the babies to visit Grandma and Grandpa down the shore. One day, I had to sit around and work on work stuff (booo!) while my wife and her friend took the collective brood down to the beach. 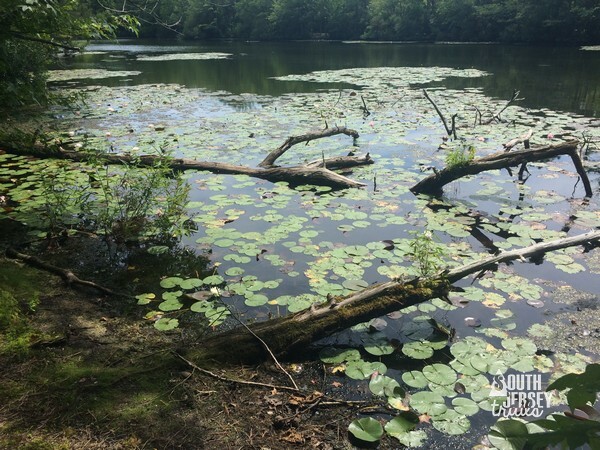 So when I could take working no more, I headed out for the closest hike I had on my list, one about 10 minutes away in Palermo – Cameron’s Wildlife Sanctuary (aka Cape May County Park North). It was awesome. 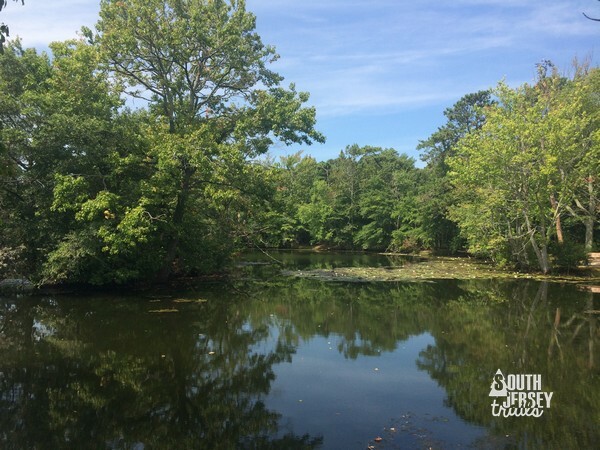 The preserve is an old sand quarry, conviently located along the railline that ran from the mainland to Ocean City. Later, it was purchased as a private hunting ground by the Cameron family. When the last Cameron brother couldn’t use the property any longer, he donated it to the county for a park. First warnings first, they are REALLY STRICT about the hours, and the extremely tall fence will make it really hard to get out if you get locked in. Get OUT by 4 PM! The positive end of that? This is a BEAUTIFUL park and the first I’ve been to in a long time that didn’t have a single piece of litter or graffiti ANYWHERE in the park. 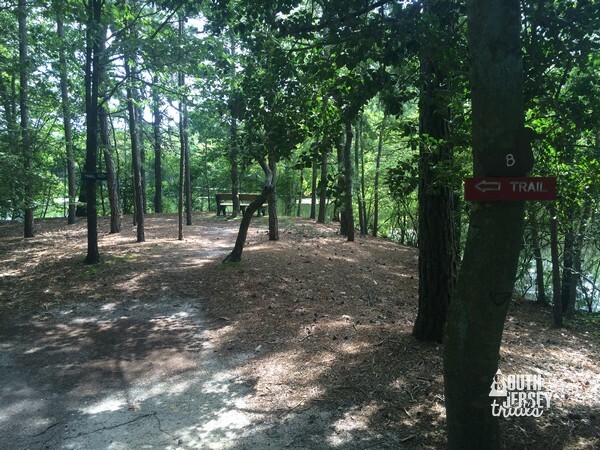 You start by walking from the parking area along the fence on a concrete path, which will lead past a picnic area to the the gate into the preserve proper. From there, an unmarked trail heads right. DON’T follow that one (I’ll let you know where it goes at the end of the post. It’s not that exciting.) Instead, follow the paved pathway (which seems to be both the Red and Blue Trail. They overlap most of their length) straight down until you reach the buildings. 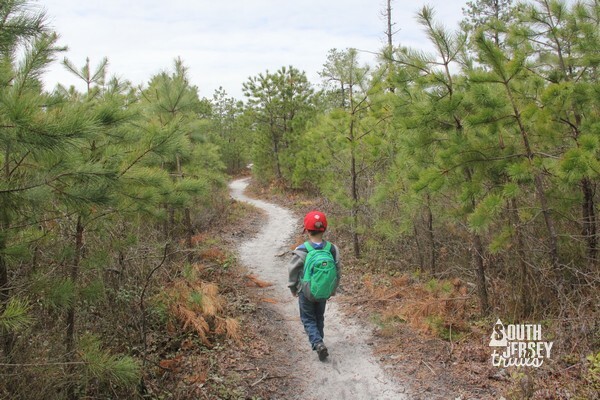 Along the way, you’ll pass a totem pole, a side trail (this is Red Trail reconnecting with itself, we’ll get there! ), a bench with a view of the lake (feel free to check this out now, or you can save it for later). While hiking this stretch, check out the drop off in elevation on the right side of the trail, all thanks to sand mining. This is the Red Trail completing the lollipop with itself. Slightly off the trail to the right. Offices now, but these buildings have been on the property for a long time. Once you get the buildings, stick with the paved path and curve around them. 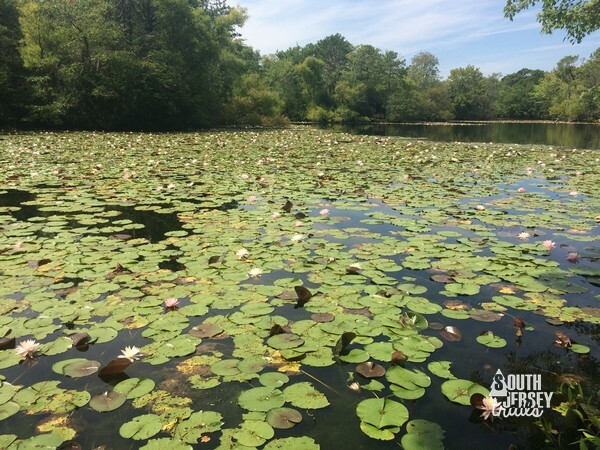 A view of the lake, featuring lilypads, will open up on the right side. What could make this view better? A SWINGING BENCH! I was now officially in love with this park. First Eagle Project of the park, I spotted six of them along the way. Awesome. The Red Trail will finally leave the pavement to the left here (although the pavement keeps going). This side split will head around another small pond. Look for the port-a-potty (the only bathroom in the park) to make sure you make the turn. Not paved, but very easy to navigate. Not as nice as the big lake, but nice. Rounding the corner of the pond. After reaching the back of the lake, the Red Trail takes a left turn just before the tiny dam release. 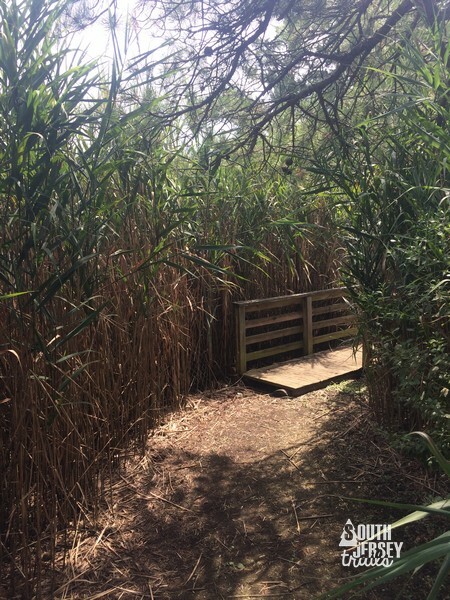 It’s the first bit that looks like a trail, and its a short detour, but it leads into some reeds, around another pond, and over a small bridge that the very, very edge of the preserve. From here, you can look toward the ocean through the fence. Through the fence toward the Parkway/ocean. Turn right after the bridge! Bench on the tiny, third pond. And back on the wide dirt trail we so recently left. The trail immediately makes a right after the bridge, follows the edge of said third pond, and rejoins the “dirt road” trail from earlier about twenty feet down from where you left this trail a minute ago. It will wander past pond #2 until you reach the large pond that we started at. The trail will again leave the road here, splitting right to leave the pavement and get a closer look at the shoreline of the largest of the ponds. Don’t worry, plenty more benches on this stretch. Splitting right to leave the pavement and stay on the Red Trail. Heading for a closer look at the pond. Did I mention they have pavilions here? Lots of them. I guess I can sit and admire the water. If I have to. Thanks for posing guys. Wish I had brought my real camera with me! From the views, the trail heads back out to pavement and makes a right turn. It will then follow a piece of land that runs between two ponds, passes another pavilion, and goes all the way down to a third pavilion where the pavement finally runs out for good. Benches and swimming benches all along the way, many with worthwhile views. Turn right onto the pavement! Making new friends. Curse not having my real camera! Another pretty lake off to the other side? I guess, if I have to. More wide open view a bit further on. With the pavement ending for real at a swamp, I turned to cross a bridge and follow dirt trails the rest of the way. The trail begins back around the far side of the lake, but not very close to the water. Within a short time, the Red and the Blue Trail, for the first time I could tell at least, split off from each other. The Blue Trail heads straight to finish going around the lake. The Red Trail heads left to meet back up with the pavement portion of the Red Trail near where we entered the preserve. Dirt trail, here we come. Nice bridge at the edge of the lake. Thank you another Eagle Scout project. Back around the final side of the lake. Trail split! Red goes left. Blue goes straight. For now, I went Blue to finish the lake loop. It would continue on for 0.2 of a mile, with some nice views of the lake and a final climb over a ridge of sand leftover from the mining days. It would end by that optional bench that I pointed out on the first leg of this hike. Over a final sand ridge. From here, you get back on the pavement and turn left. This is the original stretch of pavement you came in on, only now you are heading away from the buildings. At this point, you just go straight to the gate. Split left here to explore the Red Trail’s conclusion. Whole thing was like this. I like the woods, but take the Blue Trail back to the pavement instead of this one, even it its slightly longer. Where the Blue and Red Trail split, from a different angle this time. Then it was backtracking to the pavement and heading for the exit! But wait, what’s that sand path without a label next to the information sign? Despite the heat and not having eaten lunch yet, I really hate writing unit plans, so I decided to find out. It looks like it may once have been a blazed trail, and left back to a bench near the “near that last pavilion” bridge. But its not now (maybe its left over from before the bridge was put in?). And has a steep section. And the other trails are much nicer. So don’t worry about it, I have you covered. So I went back out the gate for real this time, pausing only to check out the sign and flag pole at the entrance to the park (surprise! Another Eagle project) before I could find no more excuses, and was forced to go back and try to work out how much of my year I could devote to the Populist movement of the 1880s. However, being the thorough (sometimes) writer that I am, I took the left split with the fences (also seen early in this post) to check out the other end of the Red Trail. It’s a very short (0.15 of a mile) bit through some woods, but nothing special. I definitely preferred the Blue Trail exit finishing the lake loop. Gate still open. Out of excuses to avoid writing unit plans. A series of very pretty little lakes left over from when sand was mined here. Also a herd of deer on the property, but I didn’t see any. Also, also, swinging benches. Hours are on the short side. Out by 4 PM, or you will be locked in. This park is small (you might get a mile a half out of it) with short hours, but totally worth making happen. The views are nice, the birds are nice, the swinging benches are nice, the whole park is great. I absolutely loved it. Interesting how you rated the park as “small”; yet, with all the pix, it seems like an all-day adventure! 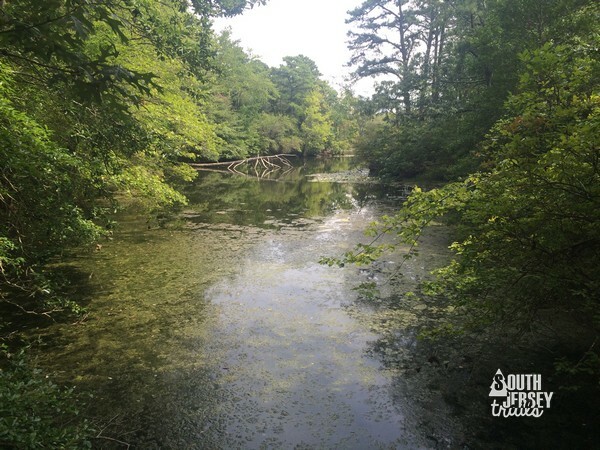 I definitely know of the existence of this park, but I haven’t gotten a chance to venture out to it yet; I have, however, seen Cape May County Park / Central (i.e. 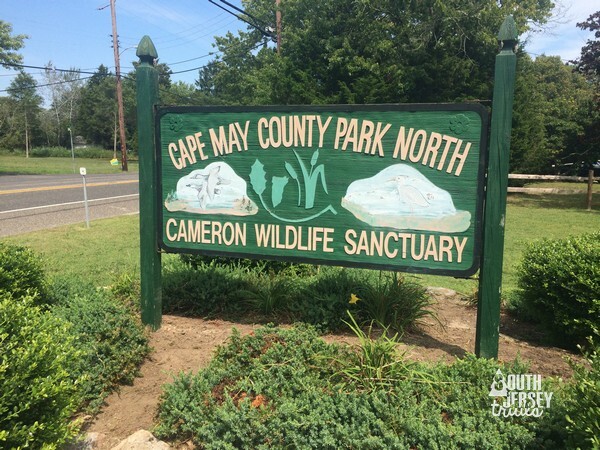 site of the Cape May Zoo.) As several times before, thanks to your pix, now I am ready to check this one out! (Perhaps later this fall, but most likely next year.) It is *definitely* going on my “list” of new adventures either way, though! With all the ponds, it sort of reminds me of Birch Grove Park [Northfield, NJ] in some areas. (I believe you have yet to see that one!) 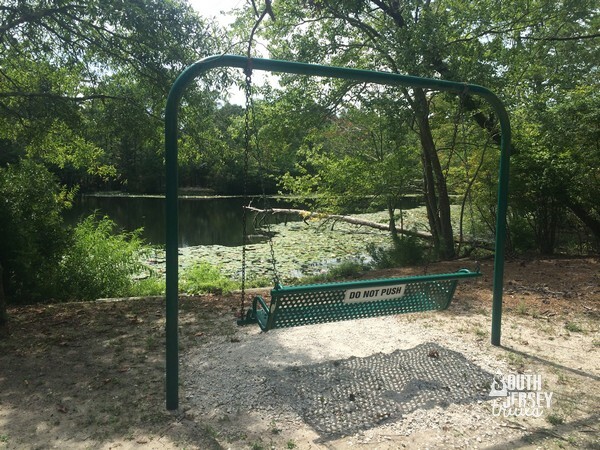 The swinging bench also looks like a good place to stop and enjoy a snack! Lovely article! Cameron is a little gem, and fairly unknown. Your pictures are a perfect illustration. I took my kids there all 4 seasons from my former home in Upper via bikes. At that time, there were deer, but they’ve been moved out due to lack of space and issues with vandalism. Now, I pop in when I am in the area for a peaceful stroll. It is small as described. The number of views in the shots make it seem bigger. Worth an hour’s walk or stroll. Lovely article! Cameron is a little gem, and fairly unknown. Your pictures are a perfect illustration. I took my kids there all 4 seasons from my former home in Upper via bikes. Now, I pop in when I am in the area for a peaceful stroll. 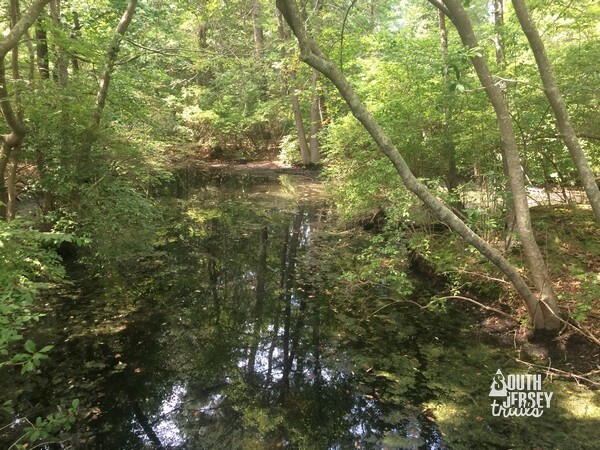 Stream Walk with the Gloucester County Nature Club at Ceres Park!